Aimee Cabo Nikolov is a Cuban American who has lived most of her life in Miami. She is a trained nurse and the president and owner of IMIC, Inc, a medical research company in Palmetto Bay. She lives with her husband, Dr. Boris Nikolov, and her three children, Danielle, Sean and Michelle. This is her first book. “Love is the Answer, God is the Cure” is the story of Aimee Cabo, who was in the Miami news for almost five years from 1989 to 1994 in a case the media named “The Case from Hell.” This sexual abuse case pitted she and her sister against her parents who denied all culpability. As she battled court battles, poverty, abuse, and addiction, Aimee always turned to love and to God. This is the story of a woman who had all the odds against her and how she persevered to find true love and form a family that could withstand anything. I was advised to write a memoir by a psychiatric nurse when I was hospitalized at 15 years old. It was a nice thought, but I never took it seriously. Life was a non-stop continuous struggle and writing was the furthest thing from my mind. For many years, survival was my priority with only God by my side. Writing a book was never thought of again until one day while in deep prayer, I received a strong desire to write my story as honestly as possible. I didn’t even question this having always been a private person when it comes to my past. I didn’t have writer’s block and I didn’t even need an alarm to wake me up at 3:00 am daily to type incessantly until my family woke up for about 6 months. Somehow, I knew it was the best way I could help others. I can show how it’s possible to experience the unimaginable for an extended period of time, make mistakes and still be forgiven and loved. I wanted to show that we are not alone and how God has a way of turning a tragedy into a blessing. My memoir will present evidence of God’s unconditional love, and how, at least for me, it was the only cure. My great love for helping others was the greatest motivating factor in writing my memoir. Even as a young child, I wanted to be involved in a field that focused in helping others. I feel so blessed that all I want to do is return the love. My story is the only way I know I can empower others as I have come to discover ways of helping I didn’t even think possible. What a great title – can you break it down for us – what does “Love is the Answer, God is the Cure” mean to you? I was usually the one my friends would turn to for advice and I would always respond with: “Love is the answer, God is the cure.” It turned out to be true in my life as God’s unconditional love that provided my husband’s unconditional love and the unconditional love for our children was the answer to all my problems. I only felt I healed once I allowed God to take over my life and trust him completely. Despite many different medications, therapies and procedures, God was the only cure to my depression. It’s amazing what God can do if he was able to cure someone like me. What were some of the challenges you faced in putting your story down on paper? I was advised not write my memoir and discouraged because of fear. It was clear to us that it would make those named that hurt me upset. Of most concern was that one of these people has a long history of suing me. Yes, I am presently experiencing an unexpected challenge that I know is nothing God and I can’t handle. I am not afraid as I have outweighed the benefits compared to the costs and I realize the bigger picture. One publisher that wanted to pick up the book said I had to change the real names and real descriptions of all characters. Once they were going to put me on television, but they said I had to change the title to one that didn’t mention God. We knew we had to self-publish. How did you deal with any old feelings that may have resurfaced while opening the doors to your past? One day at a time. I hadn’t realized I had so much bottled inside for years. Most of my life consisted of helping others. I was so busy dealing with life and its difficult challenges that I never really had time to work on myself. I was also pretty good about minimizing my entire past. I had stopped working out and lost interest in most things. For a short while I needed ketamine infusions and even tried a little bit of transcranial magnetic stimulation. Then, one day I just got tired of feeling sad. I realized that even though I am supposed to feel sad I don’t necessarily have to. It is up to me whether or not I pass the days feeling miserable or proud of myself for being productive and helpful regardless. I forced myself to do all I expected to do in a day’s work even though I would wake up not wanting to do anything. But see, I had some help. I started every day with prayer, and I prioritized God, that my actions be pleasing to him. I put myself in God’s shoes and thought that if I was him, I would want me to be happy. I learned to love myself and most importantly I learned to forgive myself as well. I realized that how I felt also affected those close to me, and this gave me even more reason to carry on, finding strength through love. What role did writing have to play in your journey? God is sweet, writing my memoir brought me to a place of healing. It was then when I first realized, from the reviews, that what I had gone though, was really a horrible thing. Before writing my book, I thought all the things I went through was just something that happens. I was able to put things into perspective so that I can come to terms with it and accept it. It was a journey very much needed and to my surprise in my attempt of helping others, I ended up helping myself. How are you using your experiences as a way to help others? The harrowing experiences I have endured has helped me understand the perspective of the survivor. I know certain things from experience that normally take psychiatrists years to understand. I also know I didn’t necessarily have to be a classic textbook case. We started a local radio talk show called “The Cure” to provide awareness and different ways of healing from any form of suffering. The show is an open dialogue that consists of testimonials, inspirational speeches, authors and professionals in the mental health field from all walks in life. My testimony is that ultimately God is the cure is you seek him no matter what else you try. I welcome all ideas as I hope that this can be instrumental in helping each another. What is the first step towards healing? What does your life look like today? There isn’t a day that goes by that I don’t thank God for all my blessings. They are so many its impossible to count. I didn’t even realize God blesses us daily until now. I have learned to appreciate even the smallest things. There is harmony at home and at my work place. I couldn’t ask for a better husband or better kids. I am so greatly blessed that it trumps anything bad I have ever experienced. I am grateful for my life because my struggles brought a purpose. Tell us about your passions – what do you like to do in your free time? I love to spend time with family and friends. I love sleeping with my little doggies. Boating is fun and I also enjoy bicycling. The best thing I can receive in life is precious memories and I love to create the same. I hope that everyone truly knows how much God loves them, that he doesn’t allow us anything we cannot handle and that anything is possible with God. Also know that all suffering passes even if it takes 25 years like me. All these things are evident in my memoir and I hope that it serves as an example of strength, perseverance and God’s never-ending unconditional love. Connect with Aimee Cabo Nikolov! 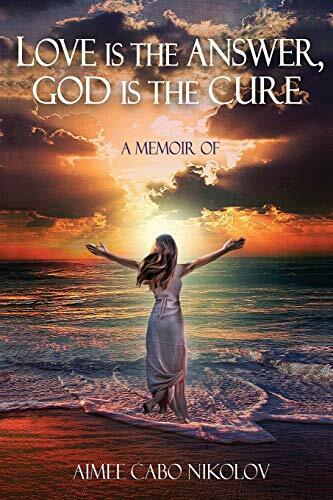 This entry was posted in Author Interviews, Books, Memoir & Biography and tagged Aimee Cabo Nikolov, Author Interviews, Love is the Answer God is the Cure, Reader Views. Bookmark the permalink.